Celebrated fashion trailblazer, Stitch Collective, uses Wishpond social contest applications to create consumer-driven luxury limited-edition accessories. Vancouver, BC (PRWEB) June 12, 2013 - Stitch Collective founder and Harvard Law graduate, Loni Edwards, is a pioneer shaking up the New York fashion industry. Using Wishpond’s Social Marketing Suite, Stitch Collective has captured the power of social in luxury fashion, giving customers a say in the most on-trend accessories. Edwards is a Harvard Law School graduate, who was working as an intellectual property lawyer at a prestigious LA law firm. She wanted to be in a more creative field. Doing what many would not: she took the leap, quit her job, moved back to New York and began forming her dream of Stitch Collective into a reality. The interactive fashion line creates innovative designer accessories based on consumer feedback. In a nutshell: Stitch puts out a call to designers, designers sketch, consumers vote, then Stitch creates and sells the winning handbag. Designers from around the world submitted sketches to be reviewed by the Stitch team. 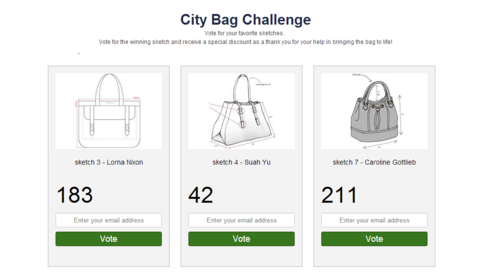 Narrowing the choices to 12 bags, Stitch used Wishpond’s Social Marketing Suite to create a mobile optimized Vote Contest directly on their site. The Vote Contest allows for an open forum for consumers to voice their desires and be a part of the creation process. The winning design - the one with the most votes - was manufactured in New York’s Garment District and available through the Stitch Collective online store. In addition to working on websites, Wishpond contest tools are easy to set up on Facebook and Twitter, for additional social sharing. They require no IT or technical skills. Wishpond’s Social Contact Database automatically captures participants’ demographics, geographics and contact information making it easy for Stitch to reach target groups of highly engaged potential customers with customized offers. Stitch Collective uses Wishpond products for other promotions such as Pinterest contests and Sweepstakes. They have partnered with Town & Country, The Cut and other fashionistas to create more limited edition crowd-sourced handbags. Stitch Collective is an interactive fashion line that fuses innovative design with community feedback. Stitch Collective creates limited-edition accessories sketched by designers from all over the world, and voted into our collection by YOU. Stitch Collective is driven by helping emerging designers gain exposure and excel, as well as by creating beautiful luxury accessories for a fraction of the price of comparable brands by skipping retail and middlemen markups. Stitch Collective is proudly made in NYC. Stitch Collective founder Loni Edwards has been featured on Bloomberg Law, and recognized as an emerging fashion leader at the 2013 Fashion Front Awards NYC. Wishpond makes your online marketing easy and social – for every language, and every business size. Wishpond’s Social Marketing Suite works across all channels including mobile, online, local and includes: Pinterest Contest, Vote Contest, Sweepstakes, Photo Contest, Photo Caption Contest, Video Contest, Essay Contest and Group Deal. Wishpond also offers a Landing Page builder and a website popup builder. Single User Access to Wishpond’s entire Social Marketing Suite from $45/month. See http://www.wishpond.com for product details and full pricing.